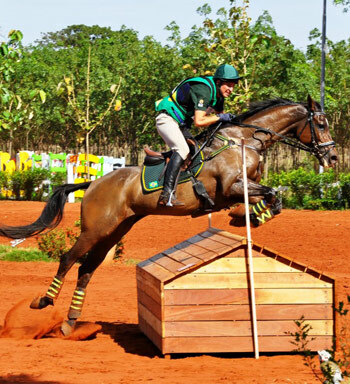 The Brazilian team coached by New Zealand’s Mark Todd has won team and individual gold at the FEI South American Eventing Championships held on home turf in Sao Paulo at the weekend. The CCI 2* event at Cross Horse Stables in Barretos was one of two qualifying competitions in the South American region for the Pan-American Games in Ontario, Canada, and Brazil has sealed its starting spot at the event next July. Brazil has been on the rise since the Alltech FEI World Equestrian Games 2014 in Normandy, France, when the team of Ruy Fonseca, Gabriel Figueirdo and Marcelo Tosi finished eighth overall, beating considerably more experienced sides including the crack New Zealand squad that included Todd. The Brazilians will be looking to peak for the 2016 Olympic Games, which are being held on home ground in Rio de Janeiro. “We are very pleased with the result which is a good step towards our ultimate goal of taking a good place in the the Pan-American Games and the Olympics,” Todd said. Of the four teams taking part, Brazil put up a convincing win, finishing more than 23 penalty points clear of the silver medallists from Chile, while Argentina took the bronze and Uruguay missed out on a podium placing. Brazil’s Henrique Pinheiro riding Land Quenote do Feroleto won the individual title from 25 other combinations. Chile was the only country to finish with a full complement of four riders, and Carlos Lobos got off to a spectacular start with a dressage mark of 46.2 which left him out in front in the individual rankings at the end of the first phase. But only three riders managed to score below 50 in dressage, and when two of them were flying the Brazilian flag that left the host nation already in a strong position going into cross-country day. Marcio Carvalho Jorge was lying in runner-up spot with Coronel MCJ on a mark of 48.3, while Serguei Fofanoff and Estiva TW was third on 49.8, and Pinheiro bolstered the strong Brazilian attack when filling fourth spot on a mark of 50.8. Pierre Michelet from France, the man who set the challenge at the Alltech FEI World Equestrian Games 2014 and at the FEI World Breeding Eventing Championships for Young Horses at Le Lion d’Anger in France over the last few months, is one of the most sought-after cross-country course designers in the world. He put his extraordinary expertise to work in the creation of the cross-country test at Barretos, and it certainly proved influential. One horse-and-rider combination retired while 10 were eliminated, and the Brazilians began to look vulnerable when Marcio Carvalho Jorge was amongst the latter, leaving them with only a three-man side going into the final day. Chile’s Lobos was still holding the lead as the final jumping phase began, having added just 0.8 time penalties during his cross-country run, and with Jorge out of contention Brazil’s Fofanoff was sitting in silver medal position having added just 1.2 to his tally. Pinheiro lay in bronze medal spot and always looked threatening when he was the only rider to bring his horse home inside the time on cross-country day. And when he produced one of just four clears over the colored poles, the 36-year-old rider rocketed up to gold medal spot with his 11-year-old Holsteiner mare in the final analysis. A single jumping error cost Lobos dearly, moving him on to a final score of 51.0 which left him so tantalisingly close, just 0.2 behind in silver medal position while, despite putting 12 additional faults on the board, Fofanoff dropped just one place to take the bronze. The final score for the Brazilian team was 199.9 which left them well clear of Chile’s Lobos, Carlos Villarroel (Paradigma), Sergio Iturriaga (Versailled) and Guillermo Garin (Ubago) on 133.6 in team silver spot. Argentina’s Juan Alberto Gallardo (CT Red Hot) and Juan Sebastian Vargas (Remonta Nantes) were both eliminated in the cross-country phase, but Marcelo Rawson (Larghago) and Luciano Brunello (Erevan) finished on creditable scores of 81.4 and 84.4 respectively. So when Francisco Calvelo Martinez and Noir de la Muralla were the only members of the Uruguayan side to post a finishing score, the bronze went to Argentina. BRONZE – Argentina 1165.8: Larthago (Marcelo Javier Humberto Rawson)) 84.4, Erevan (Luciano Brunello) 81.4, CT RED (Juan Alberto Gallardo) Elim, Remonta Nantes (Juan Sebastian Vargas) Elim. BRONZE – Estiva TW (Serguei Fofanoff) BRA 63.0.